Here, at Kirstenhof Primary, we take pride in our colour houses. The four house colours are Green, Blue, Red and Yellow. Pupils are awarded house points on a daily basis, whether it be answering a question in the classroom or picking up litter on the field. House points are given at the teacher’s discretion. House points are announced every second week in assembly on a Thursday and are presented by a group of Grade 7’s in a different and interesting way each week. At the end of the term, the house with the most points wins a civvies day and has the fame for the day. 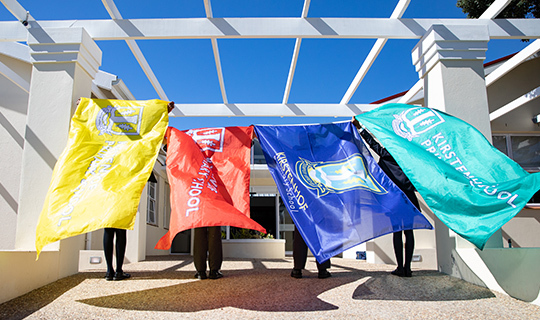 There are numerous events where the House Captains get a chance to scream and shout for their house and to spread the “gees” across the school. The Gala is always something special to look forward to and takes place at the beginning of the year. This is a time where the House Captains get their first opportunity to impart some of their enthusiasm to the House and the swimmers representing their house. Every individual in their house is equally important and is a part of team Kirstenhof. We always look forward to the Grade 6 group coming up and taking over from the Grade 7’s as they continue the good work that the past House Captains have done. We continue to look forward to more events in the years to come where there will be more competition and rivalry between the Houses, as it creates a competitive yet friendly environment to be a part of.